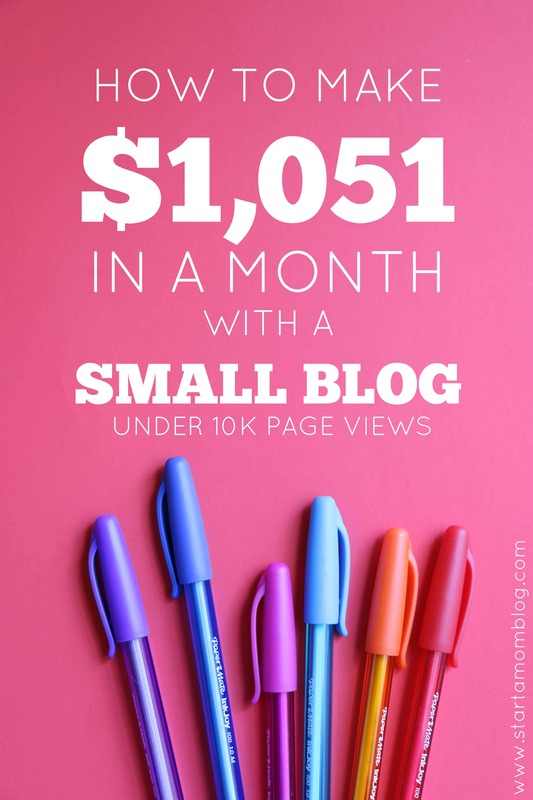 Wouldn’t it be amazing to make money with your blog on a part-time basis? I know many of you may have full-time jobs or have super busy schedules, so you can’t invest hours and hours into your blog. I want to share with you that it is possible to make money blogging even on a part-time schedule. I am so happy to introduce Julie to guest post on my blog! I’ve followed her since I’ve started Start a Mom Blog and I’ve loved all of her posts! 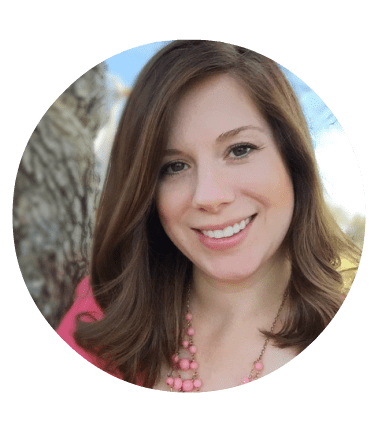 She is super creative, a great online friend and she has a knack for growing her blog! She shares so many golden nuggets in her post below – things that I’ve done that work super well too! I hope you enjoy it! Hey, mama! I’m Julie. I’m a full-time stay-at-home mom, wife, and blogger. That photo over there? That’s not what I usually look like. Most days it’s shorts, t-shirts, and messy buns. And not those Pinterest-worthy messy buns, either. Nevertheless, I absolutely love being able to stay home with my son and teach him all the good things about life. I have a three-year-old boy, and the hubby and I are so excited to be adding a baby girl to the family soon! I was first drawn to blogging as a creative outlet when my son was a baby. I had just quit my job as a teacher. While I loved all the baby talk and sweet moments at home, I craved more challenge, more risk, and more reward. Blogging has given me all of that and more! Now, my blog, Jules & Co, is centered around this idea that we can teach and love our families well. And you know what? We don’t have to be supermoms to do it. Since my blog is focused on parenting and early learning, it’s extremely important for me to be authentic about it. 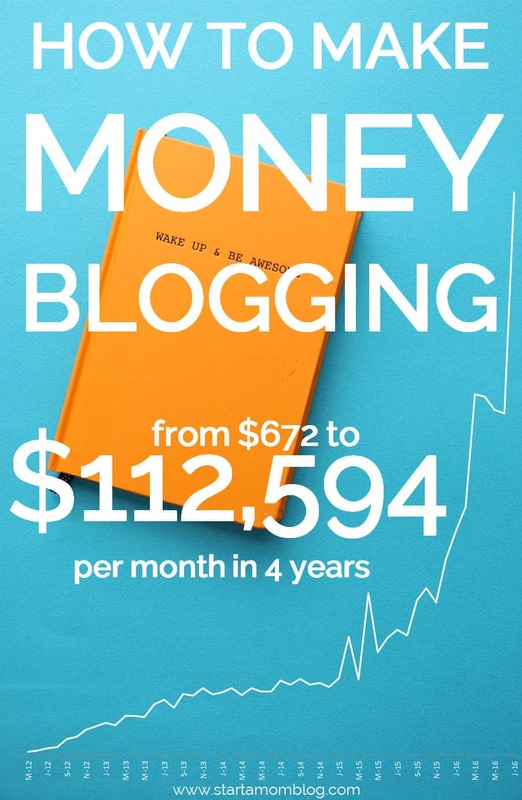 That’s why, when I share my income report with you in just a bit, I want you to keep in mind that I only work on my blog for about two hours per day. That’s only 10 hours per week! When my son naps, I work. When he’s up, we play and learn! 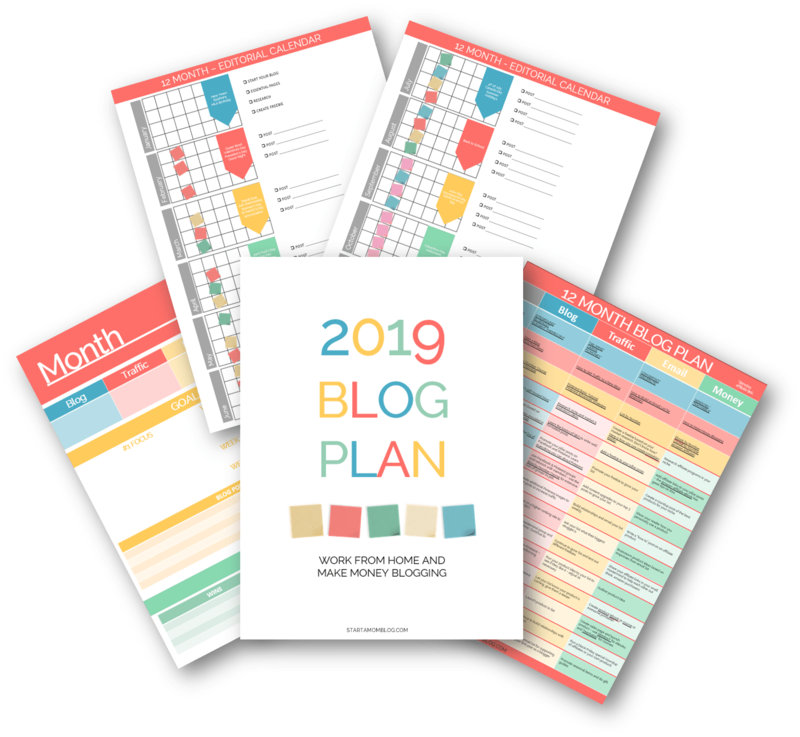 Are you thinking about starting a blog, but worried that blogging will eat up quality family time? Don’t. Blogging can be whatever you want it to be. One of the beautiful bits about blogging is that with the right strategy, you can make a decent income with whatever time you have. No excuses, mama! 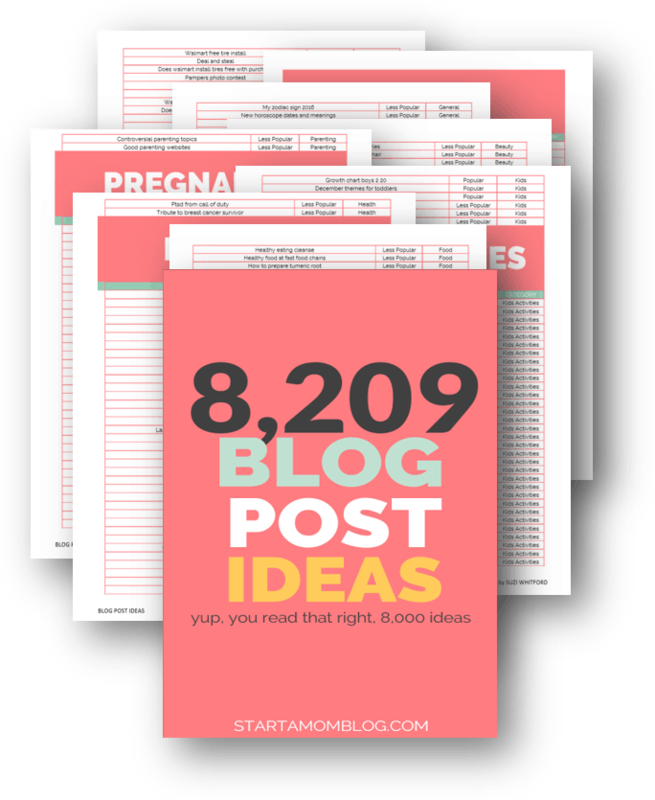 So, you’re probably here to see how I make money with my blog. My three areas of monetization are digital products, affiliates (mainly through Amazon) and sponsored posts, and ads. Out of the three, digital products are by far my favorite! That’s what I’m going to focus on today for you. One of the first things I suggest to my friends who are just starting blogs is to start thinking about a product you can sell. Think about your ideal reader. How can you solve a problem for them? Save them time? Make life simpler or easier? Since my readers are mostly moms with young kids, it was easy for me to get inside their heads. In many ways, I am my ideal reader! With my background in teaching, I love doing tot school and now homeschool preschool with my son. The experience of watching his mind open up with knowledge and his eyes widen with wonder is priceless to me. I wanted to help other mamas share those experiences with their little ones, too! I started creating a series of Early Learning Bible Curriculum packs. Each curriculum is packaged simply as a PDF download, complete with printables, songs, hands-on learning activities, and coloring pages. Since I started selling my own products, I’ve seen steady growth in my income. I started my blog in June 2015. I made a whopping $3 from June 2015 until April 2016. 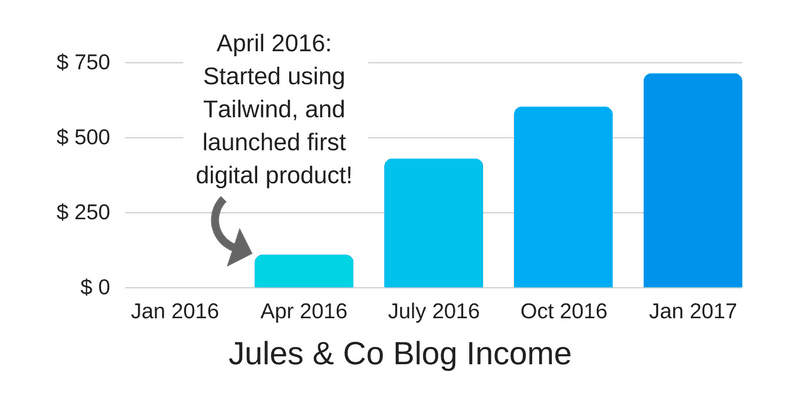 In April, I did two things that drastically changed my blog income potential. I signed up for Pinterest scheduling with Tailwind, and I also released my first early learning curriculum pack, God’s World. I made $109 that month. Since April, I’ve been working on streamlining and optimizing my email marketing systems, gaining more traffic, and launching more packs in my curriculum series. With each new product, I get better and better at sales! Now, I know these numbers may not be the thousands of dollars per month you might be looking for, but there are several things to consider. First, my products are priced low, around $8-12 per download. Second, I work at the most 10 hours per week, and during this time much less since we bought a new house, went on vacation, and did many more family things that took up time. Third, and this is what I love…once I create a digital product, it’s only an asset to my business. For example, that big month in January 2017, where I earned almost $750? Almost all of that was from three short emails I sent my list using ConvertKit. I promoted a sale on a Loving Others curriculum pack I had made months before. It literally took me about 30 minutes of email writing and scheduling to make that income. Now that I have a great system in place for my digital products, I know exactly what I need to do to scale my business. So after releasing several curriculum packs, I got the crazy idea to create a course. Remember all that risk and reward talk earlier? This is what I love about blogging. There is always something new to learn and master! I created my Unplug + Unlock course to give moms a solid action plan to unplug their kids from screen-time and unlock their imagination and potential. See? It all still points back to solving a problem for my ideal reader. I just launched this course, so I don’t have any reports or stats for you yet, but I’m really excited about the income opportunities here. Set boundaries for your blog. But don’t make excuses! You can make it work. Keep it authentic. Nobody wants perfect. They crave connection. Build your email list with quality opt-ins and promote with Pinterest and Tailwind. 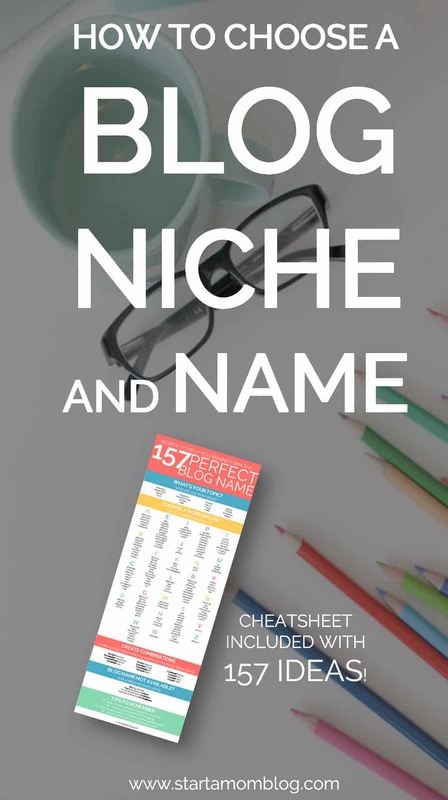 Create digital products to sell to your email list. Invest in an auto responder email system (I love ConvertKit!) to sell your digital products for you. 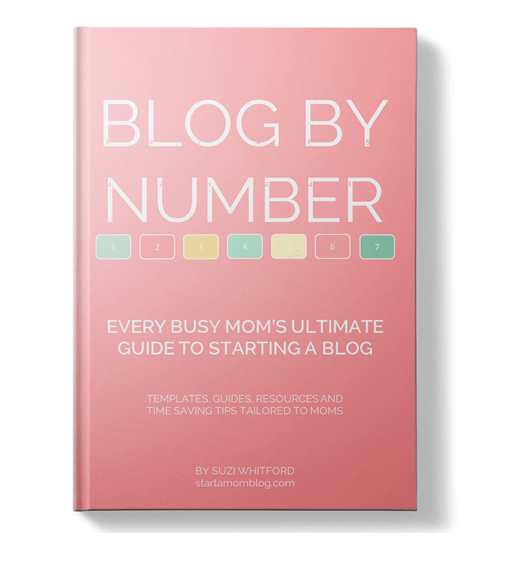 I love that Julie can grow a successful blog in only two hours a day. And the added bonus is that a lot of her material directly benefits her son’s development. What a smart momma! Leave a comment below for Julie if you have any questions! Congrats, Julie!! You sound a lot like me 🙂 I started blogging a bit before you, Sept 2014, and started making money after about one year. I also only work 10 hours per week MAX…usually more like five. This month I made a little over $2,600!! It’s been such a blessing to my family and allowed me to quit my job last month to stay home with our three little girls. Best of luck on your journey!! Congrats again!! Great post! I think that we need to be SUPER honest here and say that it is VERY necessary to set boundaries while blogging. It is too easy to always do “one more thing” and push our responsibilities as a mom and wife off to the side. Blogging provides much faster and tangible rewards/results than the daily struggles of parenting. If we choose to grow our blog slowly and intentionally, we can still make it work, but it certainly requires discipline! Elizabeth, that is very true! The first thing that suffered when I started blogging were my night time chats with my hubby. I would work late and forget to connect with him. After a few weeks I realized I had to slow down and get my priorities right again. Thanks for the true reminder!! Absolutely! I agree that blogging can honestly be a bit addicting! I think it’s so important to remember why you got into blogging in the first place. For me, it just wouldn’t make sense to spend all day blogging when I quit my job to spend one with my son. I absolutely love this. Suzi, you have been my blogging mentor and I don’t even know you. I stumbled on one of your pins and I have been following you ever since. I’m not a mom but seeing you (well reading about you) and other moms get stuff done all while taking care of little ones shows me that I have moooooooore than enough time to do this. I’ve been procrastinating on getting my blog started because there are so many people out there teaching the right way to do it and then you have others saying thats really the wrong way to do it, when nothing is really right or wrong, it’s all about what works for you. I love Pinterest but it can be a bit overwhelming at times especially when you’re just trying to get started. Thank and Julie for this post. I love this post. This is something I can almost relate to – without being teacher. I’m so looking into more work for digital products and amazon affiliates. Thank you Eliza!! So happy you like the post!